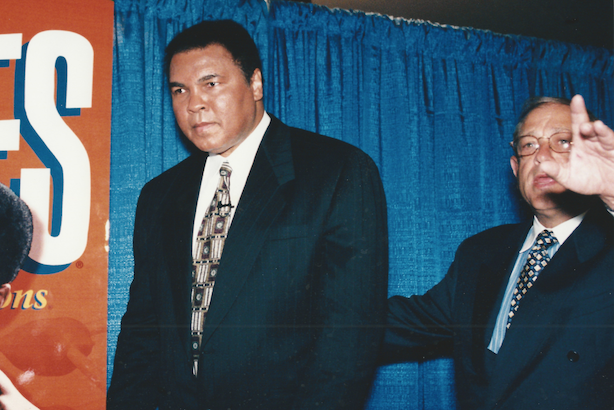 PR veteran Alan Taylor remembers hanging with Muhammad Ali - then Cassius Clay - in the 60s and publicizing his iconic world-title fight with Sonny Liston. On my desk sits a bronze cast of Muhammad Ali’s hands along with a photograph of authenticity given to me by my staff for my 65th birthday. But that was the tip of the iceberg of my life with Cassius Clay, as I knew him, in Miami Beach and later in Los Angeles, where we also spent time together. I was a sports writer, soon to become a publicist promoting Clay/Ali fights in the early stages of his career. It all started when I was growing up in Miami Beach and was sort of adopted by Chris and Angelo Dundee, the famous boxing family. Chris, the promoter that put Miami Beach smack into the middle of the boxing business, and Angelo, the talented, sought-after trainer. Cassius, as I knew him before he converted to Islam, turned professional, and the Louisville group that managed him retained the services of Angelo as his trainer. Hence, the Miami Beach Fight Street gymnasium where, as a now young sports editor at the Miami Beach Sun, I would hang out and watch this butterfly float around the ring. In 1958, I followed the wisdom of New-York Tribune founder Horace Greeley and "went west" to further my journalistic career with a newspaper just outside Los Angeles, the San Gabriel Valley Tribune. And, of course, I made boxing one of my sports beats where I would write about every fight in LA, especially those promoted by Cal and Aileen Eaton. Cassius (he had not yet converted) also went west and Angelo followed to continue training him. Cassius’ lifelong relationship with photographer Howard Bingham began about the same time, and the bond between them was as strong as the bronze hands I have in my office. After training sessions, I would drive while Clay and Bingham horsed it up in the back seat, just like any bunch of young adults. We would often end up at Angelo’s place, where he would be cooking up a homemade pot of the best-smelling and best-tasting pasta you could ask for. Boxing was in my blood. I loved the sport in those days - the glory days. There wasn’t a local LA fight I didn’t cover. And a trip to Las Vegas was a short car ride from the San Bernardino Mountains and West Covina where I lived at the time. In 1960, I covered a doubleheader championship fight in the Los Angeles Memorial Coliseum and the LA Press Club ruled my coverage the best sports story of the year. I’ve also, unfortunately, witnessed the death of two fighters in the ring. I married Claire in 1961, and as we lived as newlyweds in Los Angeles I began to realize sports writing wasn’t going to be a well-paying career and that PR was the place to be. And, of course, the PR capital of the world was - and is - New York, where both our families lived. Go east we did, but neither of us wanted to move to New York in the middle of winter. Enter Chris and Angelo Dundee again - my godfathers to the rescue. It was 1964 and a world title fight in Miami Beach was in the works for Cassius against Sonny Liston. "Do you want to handle press relations for the fight?" asked Chris. "In a heartbeat I said yes and ended up working for two PR people, Julian Cole, president of Miami PR firm Venn, Cole & Associates, who was handling the fight locally, and the legendary Harold Conrad, who was working with the closed-circuit television promoters. Boy, little did I know what I was getting myself into. It was exciting, it was fun, it was dangerous, and it was challenging. I had never had the responsibility of promoting a fight of this nature and one of the tasks was to ensure all of the world’s media was credentialed for ringside seating. I didn’t have a clue, so I said to my bride, Claire, why don’t you take on the credentialing responsibility? And she did, with the same dedication she continues to display to this day as president of the Adventurers’ Club at Boca Pointe and her Pap Corps event activities. It was OJT (on the job training) for both of us. Since we had no place to live, Dundee and the moneyman behind the promotion, Bill MacDonald, housed us in columnist Walter Winchell’s suite at the then ever-popular Rooney Plaza Hotel. Not too shabby for a young couple. The early part of the fight promotion was fairly easy. Working with media legends such as Howard Cosell, Frank Gifford, Steve Arnold, Red Smith, and all the giants of the print journalism world was exciting. Being in the training camps with Liston and his band of characters and working with Clay was a young man’s dream. At the same time, the religious aspect of Clay’s life began to surface. While he stayed true to the course of training, the influences of Islam were becoming a strong part of his life. Muslim minister and human rights activist Malcom X became a regular figure at the Fifth Street Gym. A naïve me would say, "Who is that?" Nightly at our suite in the Plaza, Claire and I would get a call from one of the men in the movement, trying to dictate what we should be doing. We didn’t listen. This is all happening to a pair of 20-somethings, trying to pick up a payday, as they say, and make some New York media contacts before heading to the Big Apple. There were more than 300 journalists from all over the world coming to the Miami Beach Convention Center to cover this epic fight. Each reporter had to be authenticated, credentialed, and seated at ringside. Each one thought he – there were no women in those days – had the right to be in a certain location. Too much detail for me to handle. I wanted to be where the action was - in the gym with the fighters—Clay and Liston. So I said to my bride, "here, you run with it." I was not one for details. Claire took it over from scratch and built a system. There were no computers in those days, and she handled all the media credentials from ticketing to seating with such efficiency that our boss Julian Cole wanted to hire her, not me, for future events. When Claire thought she had lost or misplaced some of those valuable first row ringside seats, she was in a frenzy. She meticulously retraced every step and discovered some reporter had decided to "accidently" take the tickets he wanted. You can guess what happened next if you know Claire. The tickets were returned and the reporter was nowhere to be found, especially since we were working very closely with the Miami Beach Police Department. In the final days before the fight, Clay stepped up his famous taunts of Liston. Liston did what Liston did best: sour, stern face, saying little. The weigh-in, one of boxing’s most traditional events, the pre-fight, staged press conference, and of course the post-fight press conference, primarily for the winner, were made to order for Clay’s personality. With Clay, one could only predict what was going to happen. Or perhaps you couldn’t predict, because of the unpredictable behavior of Clay, soon to become Muhammad Ali. All you have to do is watch any of the documentaries about Clay, especially about the first Liston fight in Miami Beach. Watch the coverage of the pre-fight weigh-in and post-fight press conference and you will see a young man with dark glasses in the thick of the action. That’s me. The day after the fight was another story. The influences of Malcolm X and religious leader Elijah Muhammad and his son, Herbert, had already been established. Chris Dundee and I went to Clay’s house the next morning to begin talking about his next moves, world travel, exhibitions, and endorsements. Telegrams were piling up – there were no cell phones. I remember distinctly saying, "Cassius, keep your mouth shut and you will make millions just in endorsements." That’s like telling Donald Trump to cool it. "Ya man, I will," he says. In walks Will Grimsley, the top sports writer/columnist for The Associated Press. I could have hitched my star to his wagon. I just didn’t know how big he would become, and I don’t know if that would have been a great career move for a newlywed. But I never looked back at that decision or the time I spent with Ali. Fast-forward many years and Howard Bingham invited me to a book signing on a new photo essay he had done on our friend. I went to a museum in New York for one purpose only - to see if Ali would remember me more than 20 years and a lifetime later. He shuffled in late, as usual. He saw me, walked over, and whispered into my ear, "Are you still writing?" Tears! Even more years later, Wheaties, one of my clients, decided to honor him by putting his picture on the cover of the cereal box. We staged a news conference in Madison Square Garden and, as soon as he came in, he walked over to Claire and me. He gave her a kiss and shook my hand. Alan Taylor founded Alan Taylor Communications and ran the firm for 25 years – these days, it is known as Taylor. He now lives back in Florida, in Boca Raton.